This small Catholic college offers a career-oriented liberal arts education in a fantastic location - just south of the cultural megalopolis of San Francisco and just north of Silicon Valley, a global technology center. CND offers a great concert series, on the off chance that students here would ever get bored. What is a typical Notre Dame de Namur University student like? Describe the type of person that should attend Notre Dame de Namur University. The typical student is basically someone who strives to be a student who seeks an education, but he/she is also open, understanding, vocal, and respectful to the differences of others. What are the top 3 reasons someone should attend Notre Dame de Namur University? What was a typical Notre Dame de Namur University student like in high school? Describe the type of person that should attend Notre Dame de Namur University. Someone who is open minded, wants a higher education, an overall hard working student, and someone who wants to make a difference in their community. Notre Dame de Namur University (NDNU) is the only four-year accredited university in San Mateo County. Founded by the Sisters of Notre Dame de Namur in 1851, NDNU is a private, independent, Catholic, co-educational institution. 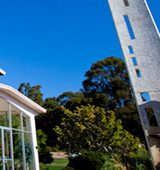 The 50-acre campus is located in the city of Belmont on the San Francisco Peninsula. The University combines a residential and commuter undergraduate program with evening programs for working adults at both undergraduate and graduate levels. NDNU currently enrolls approximately 1790 students from 24 states and 22 foreign countries. The Sisters of Notre Dame de Namur came to the San Francisco Bay Area from their mission schools in Oregon. While visiting the Bay Area they established an institute of higher learning, College of Notre Dame, in the city of San Jose. The school was chartered in 1868 as the first college in the state of California authorized to grant the baccalaureate degree to women. The Sisters soon outgrew their facility in the South Bay and moved the campus to Belmont in 1923. They purchased Ralston Hall, the country estate of William Chapman Ralston, San Francisco financier and founder of the Bank of California. Ralston Hall became the center of the campus and in recent years has been designated as a California Historical Landmark. Notre Dame de Namur University is celebrating its 160th year of service to the community. The University has grown into a co-educational, fully accredited institution that offers degrees in 23 undergraduate majors. Fifth-year credential programs in education and master's degrees in business, teacher education, psychology, English, and music are also available. What are the top 3 things that students do for fun at Notre Dame de Namur University? The 3 things that they do are attend social events hosted by the school, sign up for the clubs and organizations created by the students and throw parties. Campus housing is available for undergraduates. Housing deposit : $200.00. Housing deposit is not refunded if student does not enroll.. No cars. No pets. 39% of students live on-campus. Judith Maxwell Greig , Ph.D. The average student pays $27,008 for tuition, fees, and other expenses, after grants and scholarships. Total stated tuition is $30,806, in-state and on-campus, before financial aid. Learn more about financial aid at http://www.ndnu.edu/admissions/financial-aid/. Estimate the net price for you at http://www.ndnu.edu/admissions/financial-aid/day-undergraduate/calculator-freshmen.aspx. Notre Dame de Namur University participates in the NCAA Division II for college athletics. Want more info about Notre Dame de Namur University? Get free advice from education experts and Noodle community members.